At long last, WELCOME TO THE MACHINE QUILTING BLOG HOP!! WooHoo!! My friends and I will be posting every Monday for the next 10 weeks as we quilt our way through The Ultimate Guide to Machine Quilting by Angela Walters and Christa Watson. You can find all the details and links to my friends' blogs by clicking the chalk board button at the very bottom of this post. Also, as you will see, I am going to attempt a regular free motion quilting practice for 10 straight weeks. My goal is to machine quilt at least five days per week, then write a little paragraph about what I did and what I learned that I will share with you the following Monday. Now, since this brilliant plan didn't strike till Thursday Night, I only have 3 segments this week, but you'll get the idea, and I hope you'll enjoy them! 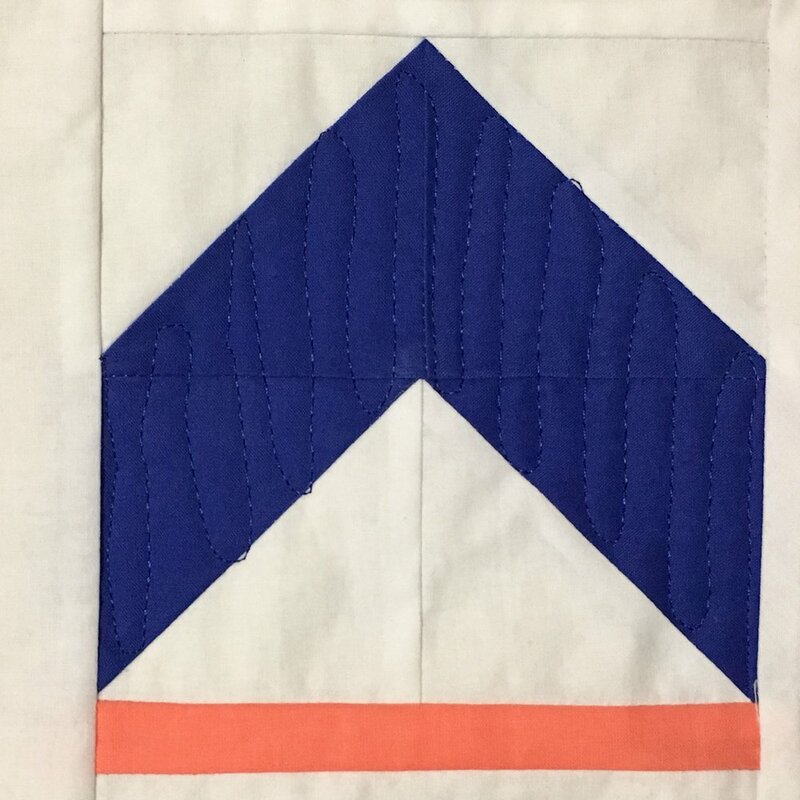 The first quilt in this book is called Plumb Lines and was designed by Angela Walters. This quilt lends itself particularly well to what I usually think of as border designs, but I got a little creative with them. I went to Joann today and got thread to match the Modern Birds in the Air quilt (designed by Frances O'Roark Dowell). I'm going to try Sulky's rayon threads-- the colors are gorgeous! I started with Switchbacks (see at top and below) on the royal blue geese. I want the curves to be like flight feathers. The larger geese are trickier because I lose track of where I am in between point A and point B moving across the space. I'm learning that quilting is a bit like dancing-- it's not just about knowing the moves but also about developing my spatial awareness so that I "use the space" as we used to say in ballet. That means I need to fill the space and not flood out, but it also means that I need to adjust my scale and movements depending on where I'm quilting so that there's not gaps around my motifs. I added Zig Zags in the triangles under the wings to make tails. Hubster didn't catch on at first that it was meant to be the impression of the tail, but he assured me that it looked cool anyways, so I'm going to go with it. Ha! I finally decided what to do about Spiral Chains and Square Chains-- I made them large and used them like an all over filler in two columns of the next #OperationSmiley quilt. And I might have gotten a little goofy trying to handle the weight of the quilt as I moved down the columns... Anyway, these designs moved very quickly and have a whimsical quality in their wonkiness, but next time I need to slow down enough to even out my stitches more. Even so, I can't wait to see the texture after this is washed! Finally, I just did a practice swatch of Ribbon Candy tonight. I want to add it on the border of the #OperationSmiley quilt, but this design messes with my head, so I need to keep practicing! On the up side, my stitches look more even than usual. yay! Thanks so much, y'all! I hope you have your own copy of the book and are stitching along with us! If so, be sure to post pictures to Instagram and use #machinequiltingbloghop so we can admire your work! As I mentioned above, all four of us will be posting each Monday for 10 weeks, and you can click the chalk board button at the top of this paragraph to visit the Machine Quilting Blog Hop Directory. For daily updates from my sewing room as I develop my machine quilting skills, be sure to follow me on Instagram @stringandstory.